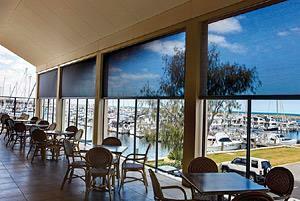 Sunshade Blinds allow you to enjoy the view while providing up to 95% protection from the Sun, Wind and Rain! Sunshade blinds are essentially outdoor blinds, made from a woven mesh fabric which provide greater privacy than PVC blinds and are available in a range of popular colours to suit your homes colour scheme. A great solution for your outdoor living space, pergola, patio or verandah, sunshade roller blinds, sometimes called shadeview blinds or shade blinds, are easy to operate by one person; in one easy action. You can raise and lower them to the height you want, to shade you from the suns glare or have them all the way down to protect you from the elements. They also provide great privacy ! 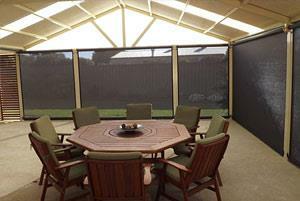 Here at Mr Blinds Adelaide, we manufacture and recommend the Zipscreen blinds track guided system which requires no ropes, no pulleys, no buckles, no crankshaft mechanism and therefore no struggle. 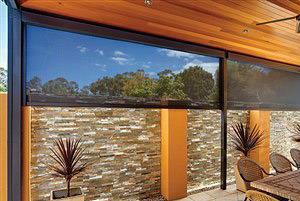 To request a free measure and quote on sunshade outdoor blinds, please get in touch today.